Antonio Detablan, a 34-year-old father from Calamba, Laguna has been selling homemade banana cakes on the side of the street, hoping to raise P1.6 million (S$120,000) for his son's operation. Antonio Detablan, a 34-year-old father from Calamba, Laguna has been selling homemade banana cakes on the side of the street. 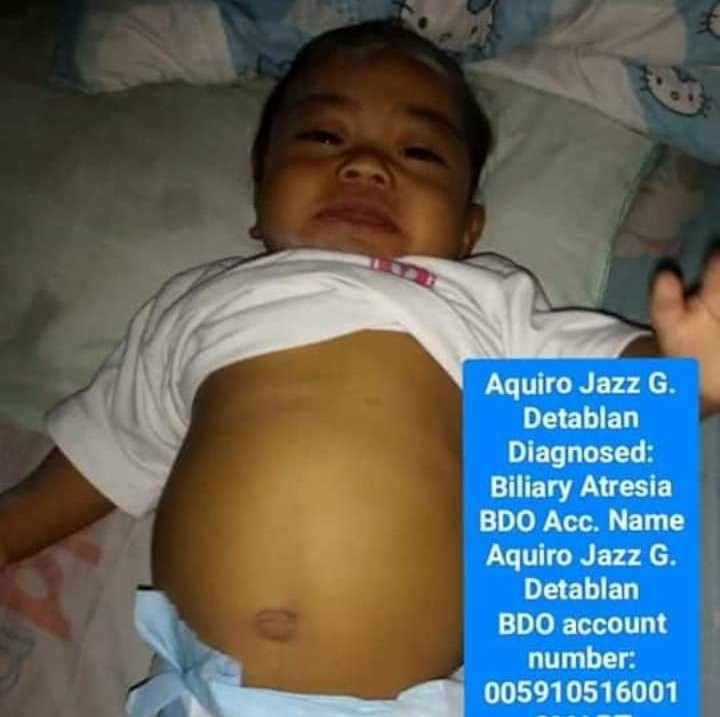 He has an 8-month-old son, Aquiro Jazz, who was diagnosed with biliary atresia last October 2018. Biliary atresia is a rare disease of the liver and bile ducts which occurs among infants. On Friday, March 1, a concerned netizen named Jenny Sumalpong took to Facebook to share heartwarming photos of Detablan while he was seen carrying "Baby Aki" and was at the same time selling some banana cakes for P120 (S$8) per loaf in the hopes of raising P1.6 million for the operation. Sumalpong's post swiftly went viral with over 132,000 shares as of writing. Detablan's wife, Jabee Imano Galindes, 34, told INQUIRER.net that they already have three children namely Anexi Jazz, Arkhin Jazz and Aquiro Jazz, ages 8, 4 and 8 months old respectively. The couple has been married for nine years. Galindes is a stay-at-home parent, while her husband is a baker. She helps him in raising funds by selling printed shirts and by holding online raffles for a cause. She also shared to INQUIRER.net that their second child Arkhin survived hydrocephalus in 2016, which made them believe that a miracle can happen again to their family. Their family has received donations from people whose hearts were touched by their story. "Maraming maraming salamat po kay Lord at sa mga taong hinipo Niya ng kanyang mahiwaga at mapagpalang mga kamay," (Thank you so much to the Lord and to the people He has touched with his gracious hands)," Galindes said. "Si Lord na rin po ang bahalang magbalik ng kanilang mga kabutihang loob para po sa amin at lalong-lalo na po kay Aki," (It is the Lord too who will return their goodness to us and most especially to our child Aki), she added. Baby Aki is regularly taking multivitamins as medication while waiting to be operated. His doctor told his parents that Aki must undergo the operation before he reaches one year of his age, or he will not make it in two years of his life. In a liver transplant, a person's sick liver needs to be replaced with a new one, coming from a healthy liver donor. Organ donors can be children or adults whose families agree to use their relative's organs after they die. After the liver transplant surgery, the patient's condition must be observed for possible problems that may arise such as bleeding and infection. In some cases, rejection of the new liver may happen in the patient's body when it fails to recognise the replaced organ. The patient will also have to take lifelong medications which include immunosuppressants so that the immune system will not attack the new liver. Those who would like to donate to help Baby Aki may reach Jabee Imano Galindes or Antonio Detablan at 09475362919.